Christmas is one of the most celebrated holidays in the Philippines. 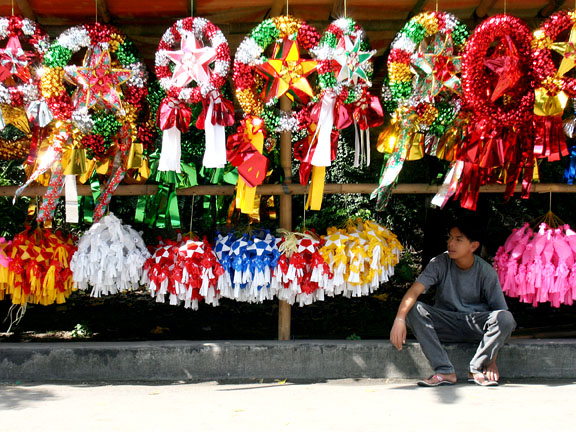 In fact, the country has earned the distinction of celebrating the world's longest Christmas season, with Christmas carols heard as early as September and the season lasting until Epiphany, the feast of the Black Nazarene on the second Sunday of January, or at the Feast of the Santo Niño held every third Sunday of January. Of course, the Filipino Christmas would not be complete without the traditional Philippine Christmas symbols and decorations. The Filipino has several different ways of adorning the holiday season where homes, buildings, malls, and every city streets are illuminated with Christmas lights and decors. The word "Parol"or Christmas Lantern is a Spanish word "farol", meaning "lantern". 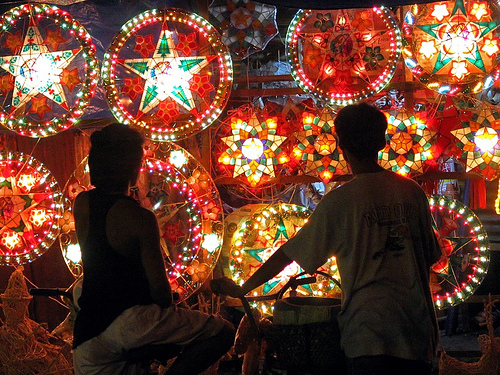 It is one of the most iconic and beloved symbols of the holiday that adorns every Filipino home. Patterns of the Paról evolved from the five-pointed paper star lantern originally crafted by an artisan named Francisco Estanislao in 1928. The earliest Paróls were made from simple bamboo sticks, Japanese rice paper known as "Papel de Hapon" or crepe paper, and a candle or Kalburo (carbide) for illumination. This kind of Paról was used by barrio folks to light their paths during the Misa de Gallo as electricity was yet unavailable at the time in many rural areas. Present day Paról takes various shapes, forms, and sizes, but generally the most basic 5-pointed star pattern remains dominant while others are made of cellophane, plastic, rope, Capiz shell, and a wide variety of materials. The design of the Paról evokes the Star of Bethlehem that guided the Three Kings to the manger. It also symbolizes the victory of light over darkness and the Filipinos' hope and goodwill during the Christmas season. Paról Making is a folk craft, and most Filipino kids in one way or another have tried their hands in Paról making perhaps as a school project. After celebrating Christmas , people are so excited to celebrate another new year celebration in the Philippines. I wish that this coming new year, we could have a good year. Good day! I saw that the RSS of this site is functioning without any failures, did you execute all the settings by yourself or you simply turned to the original settings of the widget? Thank you for the info. I have actually configured manually the RSS feed setting of the widget. Happy New Year!